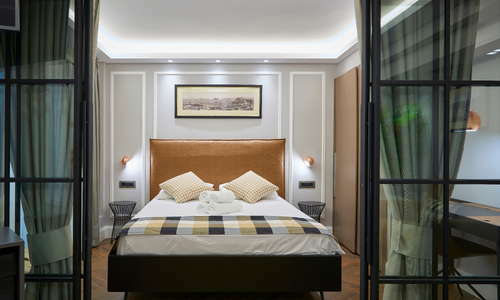 A charming, family-run and wonderfully tranquil hotel with garden-style furniture, an airy, naturally-lit ambiance and comfortable rooms with en suite or shared bathrooms, Marble House is a great option for budget travelers who wish to stay at a home away from home. The owners are very welcoming and everything is spotlessly clean. YOU SHOULD KNOW The four-storey hotel is stairs-only, so guests with walking difficulties will have a difficult time getting around. With 16 rooms, Marble House offers one room with 2 bunk beds, and 4 rooms with shared bathrooms as well as sufficiently spacious double, triple and quadruple rooms, some with stocked kitchenettes, and as of recently, has a more upscale, 42m sq, ground-floor apartment that sleeps five, next door and with a large private terrace. All the lodgings are squeaky clean and cozy, but the no-frills modus vivendi here means breakfast and A/C come with an extra charge (all rooms have ceiling fans). 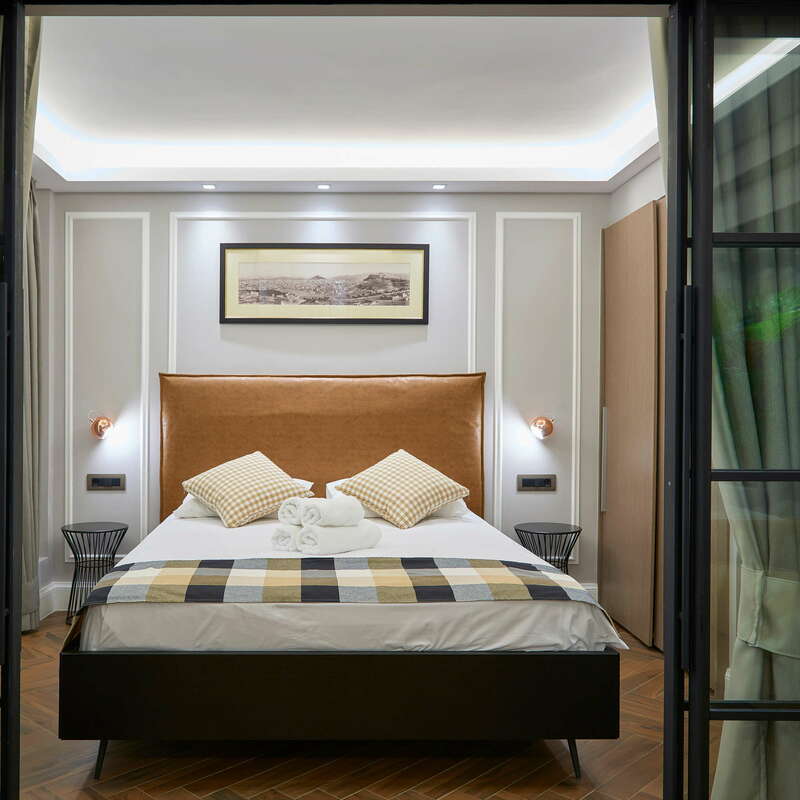 The soundproofing could be better and the WiFi signal stronger, but for a budget hotel the rooms are surprisingly comfortable, aided by a soothing decor in soft, warm hues like burnt orange, baby blue and butter yellow blended with neutral tones. 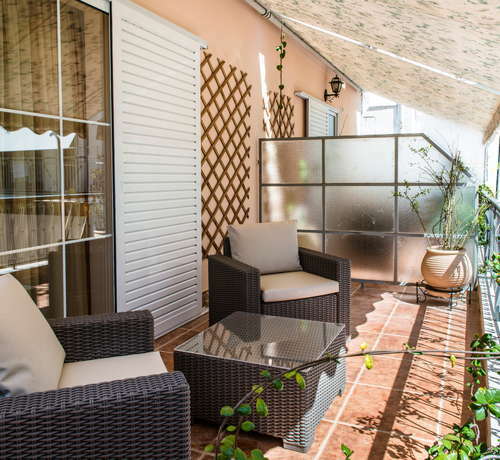 YOU SHOULD KNOW Pour yourself some wine and relax on your furnished, spacious balcony. The view may not be great but at least you can chill out in the evening breeze. 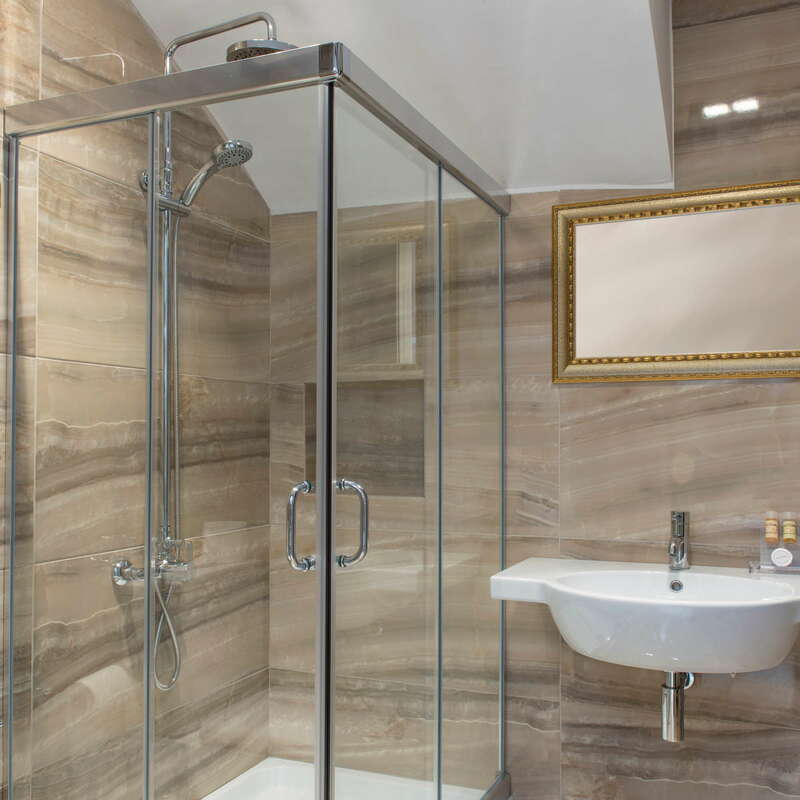 The bathrooms have cream marble walls, white sinks and showers with glass partition, so they are modern and stylish, but quite small. Toiletries are by Greek company Papoutsanis and towels are provided. As the hotel’s name implies, the main element here is white marble, representative both of Greece’s ancient past and of its wealth of natural resources. 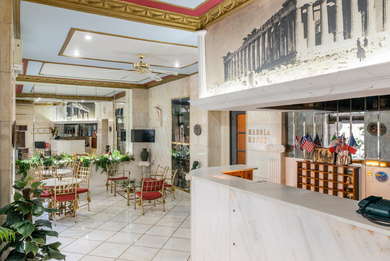 A giant image of the Parthenon tops the reception desk and classically-inspired mosaics decorate the floor and wallls. 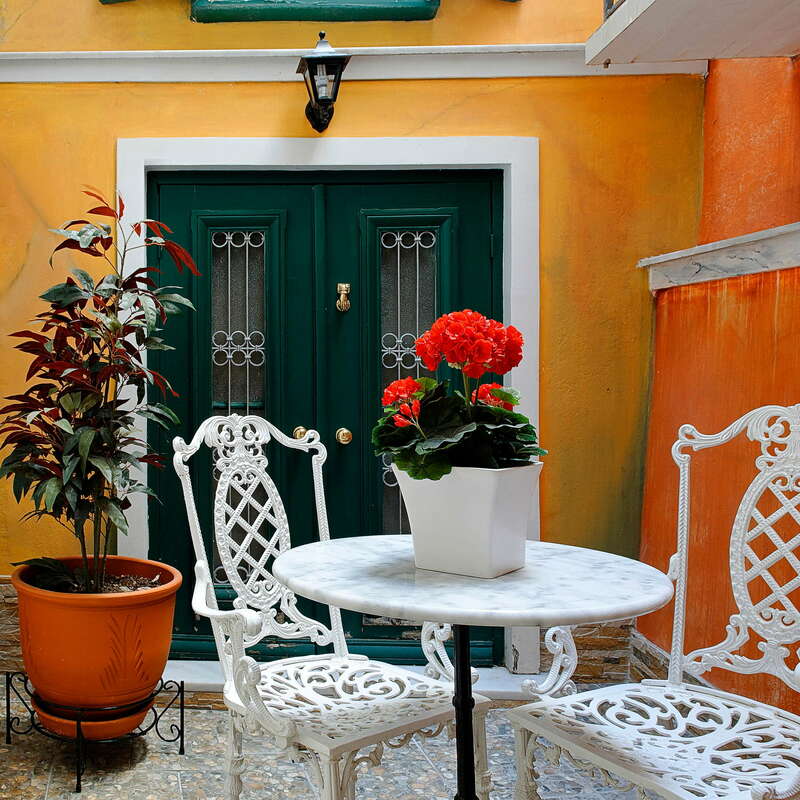 YOU SHOULD KNOW The courtyard is a lovely place to relax. Continental breakfast is served on the premises at an extra cost of 5 euros per person. No drinking facilities are available on site. Just a 3-minute walk from Syngrou Fix metro (on the Red Line, just one stop after Acropolis and two stops after Syntagma). At Syntagma you can take the Blue Line, and that will get you to the Airport (a 40-minute ride). By taxi from the airport the distance is around 45 minutes and the cost between 35 euros (daytime) and 55 euros (after midnight). Piraeus port is a 20 minute cab ride away. 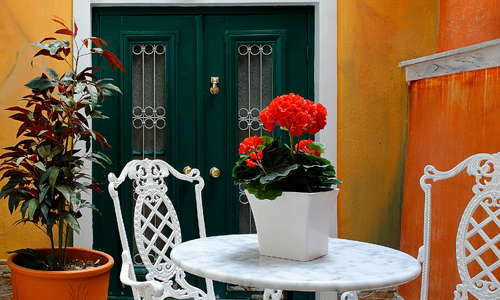 Head to Fabrika Tou Efrosinou (5-minute walk) for an interesting and satisfying rendition of regional Greek cuisine. Guarantee sandwich shop (5-minute walk) specializes in deli creations on the hoof and Mani Mani (5-minute walk) is perfect for tasty Peloponnesian meze dishes and mains. Try an excellent selection of Greece’s grape varieties at trendy BOBO Winebar (5-minute walk), chill out over a cocktail (or hangover brunch) at Bel Ray (5-10 minute walk) or fill up on delicious cocktails and snacks at Kinono (5-10 minute walk). 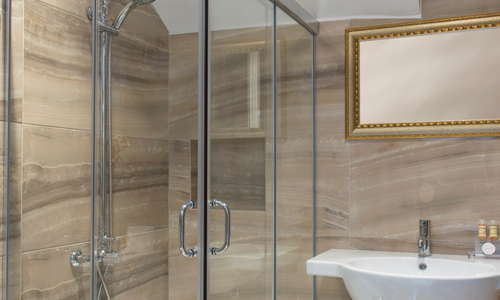 Marble House has been going strong since the late '70s, and now under the management of the family’s second generation has gone to great lengths to keep its standards high via renovation and being able to meet all the customer service demands of our times (at the Bed & Breakfast level). Although a no-frills budget hotel, it also offers a true sense of comfort, and the new apartment is a great option for families. One of the cheapest accommodation options in the Acropolis vicinity.